While Goerke would certainly have preferred to win the second moto and claim first overall – something that has eluded him so far this season – the Floridian had no cause to feel as if he under-accomplished at Prince George: He collected enough points to close the gap on archrival Colton Facciotti’s series lead from 21 points to just four. For his part, Epstein remains in eighth place on the scoreboard, but he has tightened up his deficit on the top-five in the series. The start of the first 450 moto saw Goerke in third place, going into turn 1, behind Kaven Benoit and Tyler Medaglia, who pegged the holeshot. Before the lap was even completed Goerke had installed himself at the head of the pack and never looked back. By the halfway mark of the moto he had a 14 seconds lead on Benoit, who had passed Medaglia for second place. Although Benoit moved heaven and earth to challenge Goerke for the lead, the Quebecer would finish the race a sizeable 7.5 seconds behind Goerke. The start of moto 2 looked promising for Goerke, who found himself in fourth place behind Cole Thompson, Facciotti, and holeshooter Benoit. A few laps into the moto Goerke set Thompson up for a pass, but the manoeuvre resulted in a get-off instead. Goerke was able to remount quickly enough to lose only two positions. Just before the halfway mark he had taken over fifth place to shortly thereafter inherit third, after Thompson and Facciotti went down together. Medaglia, who had passed Goerke, after Goerke’s crash, took over second place thanks to the Thompson-Facciotti crash, to pursue Benoit. Benoit, however, managed to maintain his lead to the checkered flag and with it the overall. Dillan Epstein, meanwhile, still in search of an overall podium finish, came up short again. But not for lack of effort. He was able to deliver noteworthy 5-5 motos on the very rough and muddy, difficult to pass on Blackwater MX track. Early morning rains had left the circuit muddy and puddle-filled in some places, spongey in others. Later in the afternoon the track had dried up in some areas, but was still slick in others, calling for tricky and cautious racing. Epstein got off to a lukewarm start in moto 1, reaching the first turn just inside the top 15. He poured on the gas, however, to pilot his YZ450F into fifth place by lap 6. He would remain in that position till the checkered flag. The second moto start saw Epstein around seventh place going into turn one. He charged from there to take over fifth place on lap three, losing it briefly around the halfway point of the moto, to quickly reclaim it and take it to the finish line. “Prince George was a good weekend. We made up some valuable points in the championship. Both Matt and Dillan rode freat and we’re looking to keep building on another great weekend in Manitoba,” team manager Steve Simms said. 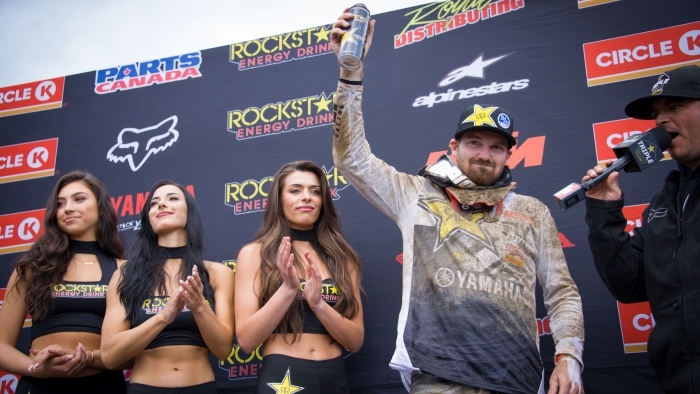 The Rockstar Energy Triple Crown Series continues with Round 4 of the MX Tour on Saturday, June 16th at McNabb Valley MX in Minnedosa, Manitoba. For Prince George results and current points standings please see following page.